Sliding into my favorite month -- end of Daylight Savings time gave me a leisurely morning. It's rainy and grey, my favorite kind of day. I know the month won't always be or feel this good, but right now I'm OK.
Today was All Saints Day, and our church lit candles and rang a bell after the name of each person who had died this year was spoken. I was crying, thinking about Gran and wanting to see the candle for her and hear her name spoken. I miss her deeply and at times acutely. I've dreamed about her two nights in a row. It's nice and also heart-shattering to dream those dreams since I have to wake up. I am committing to writing a blog post every day this month. I can't promise GOOD writing or even INTERESTING content, but it will be here. I have a list of blog post ideas, and hopefully I can write them all over the next 30 days. I haven't written in ages, hamstrung a bit by the idea of local people looking for crochet projects would instead find me ranting about Sunday school or Baton Rouge traffic or Louisiana politics. 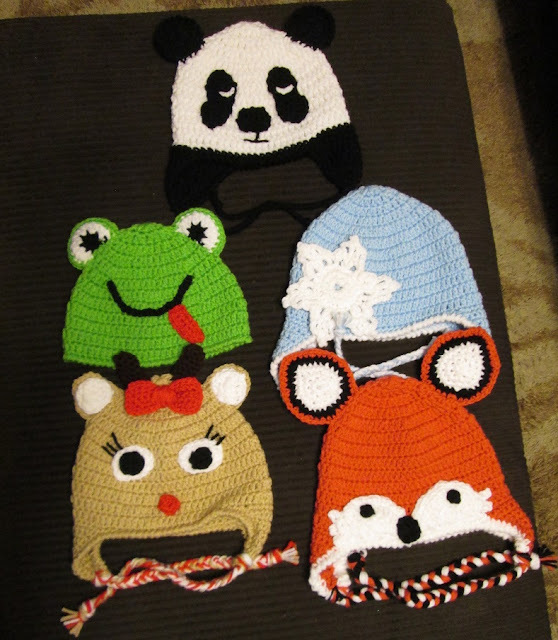 And just in case - here's a picture of the latest crochet hat order I made: panda, frog, snowflake, baby reindeer and fox. I love that you are still doing this. I got invited to the novel writing version of NABLOPOMO. It was OCT 31, 10:00 PM to NOV 1, 2:00 a.m. At the stroke of midnight they started working on their novels. It was held at an art gallery/studio and some published authors came to offer advise. I passed. Too late for me.